WARSAW, Dec 16 2012 (IPS) - A recent hunger strike, involving over 70 migrants detained in heavily guarded centers across Poland, is forcing the country to face its new responsibilities as a migration hub within the European Union. Poland currently has six detention centres, which host ‘irregular migrants’, or foreigners caught living illegally in Poland, awaiting deportation after their asylum claims have been rejected or after getting caught trying to cross the Polish border that leads deeper into the EU. At the end of October, an estimated 375 migrants were being held in these centres. Among them were 33 children, including at least one year-old baby; three of the children were unaccompanied. Georgians and Russians of Chechen nationality currently make up the bulk of migrants in Poland, though more recently Syrians, too, have had a significant presence in detention centers. The hunger strikers, mostly Georgians and Chechens, were demanding better conditions in the camps, but also disputed the use of detention as a means of addressing the thorny issue of migration. The protest was coordinated across four camps: Lesznowola, Bialystok, Biala Podlaska, and Przemysl. It lasted only a few days, ending when humanitarian organisations visited the camps and promised to work with the institutions’ management on improving living conditions. 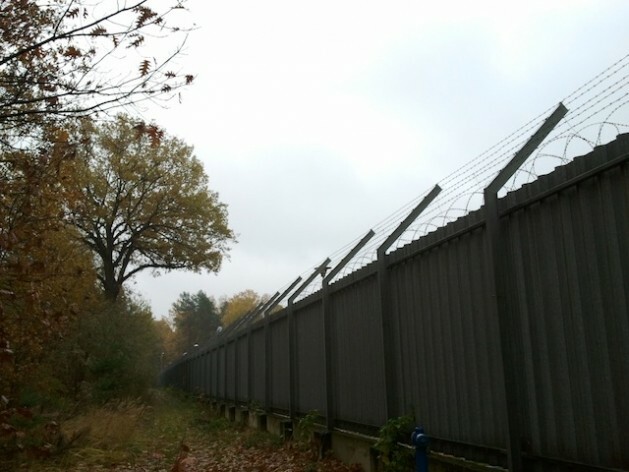 The detention camps in Poland have functioned under the authority of the National Border Guards since 2008 and conditions inside vary widely. Lesznowola, situated in a forest about 15 kilometers south of Warsaw in a former military compound, is notorious for its poor conditions. Biala Podlaska, located in the eastern town by the same name, close to the border with Belarus, is a modern facility constructed in 2008 and funded almost entirely by the European Union. At first glance, the two camps could not differ more. The narrow corridors at Lesznowola are replaced by shiny, freshly painted spaces in Biala Podlaska. The non-English, non-Russian-speaking management staff at Lesznowola stand in stark contrast to a highly communicative management team – equipped with translators – at Biala Podlaska, where staff in perfectly pressed uniforms roam around the corridors wearing professional smiles. Biala Podlaska is equipped with a green football field, while Lesznowola only has plans to eventually build one on part of its cemented courtyard surrounded by barbed-wire-topped walls. But upon entering the halls of either institution, it quickly becomes clear that, for those living behind bars almost round the clock – with the exception of mealtimes, exercises and the occasional educational activity – the situation is exactly the same. At the first sound of visitors approaching, adults and children stick their heads out of the cells that line the hallway, their hands and faces pushed against the bars, curious, waiting. Even a mundane visit becomes a noteworthy event in a place where nothing happens. Thirty-six-year-old Iranian Leila Naeimi, who was released in early October after spending two months in Lesznowola, has harsh words about the conditions there. “Everywhere you see only walls, everywhere the guards are with us, they treat us like animals,” she told IPS, adding that guards make daily inspections at 6 a.m., entering the rooms without even knocking on the door. Naeimi, who she fled Iran fearing prosecution for her work as a women’s rights activist, says that she has often been the target of sexually abusive comments from border guards, both when entering Poland and also in the detention centre. She claims basic hygiene products were never sufficient and that the food served in the centre was of poor quality. Her greatest grievance, however, has to do with the EU’s attitude towards migrants in general. “They can send you from country to country whenever they want, they think they can play with people’s lives…as if I was a ball they can just kick around. “We need normal lives, we wouldn’t have left our countries if things had been good there. I’ve had too many problems just because I’m Iranian, just because of my nationality,” Naeimi lamented. Osman Rafik, a 33-year-old Pakistani man who was detained in Bialystok at the time of this interview, has already spent eight months in the camp, but decided against joining the migrants’ hunger strike, claiming its goals were too “ambitious” and “diverse”. While he did complain about conditions in the camp and even asked IPS for help with securing medicines, his primary concern was not with everyday life in the camp but with the arbitrary nature of migration policies. “We keep being asked why we came to this country if we are from Pakistan, but they must understand that we are not criminals just because we crossed the borders into Europe. “I would like to stay here in Poland if I (am) released,” he continued. “After all, it has been almost one year since I have been in this country and life is not so long, people live about 50 years on average. They (the immigration authorities) have already taken away one year of my life. “We cannot go back to Pakistan, we have problems there, but authorities here do not understand that, they treat us all the same, whether we have problems back home or not,” he concluded. *This story is the first of a two-part series on immigration in the European Union.